For students looking to find great FAFSA tips, you have come to the right place. I will provide you with tips that will help you to get as much money as possible for financial aid. To begin with, make sure you file early. January is an ideal time to go ahead and get the FAFSA out of the way. Some schools and now seven states—Illinois, Kentucky, North Carolina, South Carolina, Tennessee, Vermont and Washington—award aid money on a first-come, first-served basis until funds are depleted. It’s easiest to file your taxes first and then use that as a reference point for filling out the FAFSA, but you can also estimate fields on the FAFSA form using your last pay stub and last year’s tax return. Furthermore, use a supplementary letter to explain extenuating circumstances. Though the FAFSA asks more than 100 questions, there’s no opportunity on the form to explain specific family circumstances, like a recent job loss or high medical bills. If there are more facts you think financial aid officers need to know, send in a supplementary letter explaining the situation that might necessitate more aid. Finally, don’t game the system. Lying about your income or assets on the FAFSA is a form of fraud punishable by a fine up to $20,000, forfeiture of financial aid awards, and potential prison time. With more collaboration between individual colleges, the Department of Education and the IRS, schools have become more savvy in sniffing out fraudulent applications. Thanks George for sharing these great FAFSA hints. I like your suggestion about sending supplementary letter to the school financial aid office, as this may increase your financial aid offer for students with special circumstances. Each semester of college begins with a flood of excitement to begin classes, move into a new place with friends and be another year closer to graduation. Along with the excitement of the semester comes a great deal of stress and anxiety that can feel overwhelming to students and their families. Not only are classes, social lives, schedules and extra activities demanding; the financial stress that comes with college can take a toll. There are, however, tips that can help breakdown the issues that prospective and current students face each year of college. First of all, nothing can set a student back and add stress as much as procrastination. Saving things such as applying for aid or giving the school required documents for later will only make the process more stressful and less lucrative. Typically there are early deadlines for scholarships, college admissions and FAFSA that can put students who apply within that time frame in a better position to get better aid or an earlier decision before the students who wait until the final deadline. It is important to add these deadlines to a calendar that is regularly accessed to keep on top of upcoming cutoff dates. Keeping a running list of what you want to do, have done, need to do and dates for everything will keep you at ease as every bit of information is in one place and easy to access. I recommend making a table or calendar that is specific to the aid and schools that you are applying for. This step may take some time and research but in the end will make keeping on top of everything easier and less stressful. Talk to parents about when they will have their tax information done and set aside time with them to work on the financial requirements. 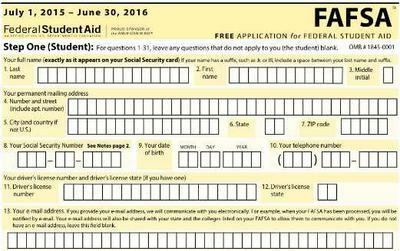 FAFSA is an “Office of the US Department of Education” and stands for Free Application for Federal Student Aid. As they are the largest provider of student financial aid in the US, they are on your side to help you pay for college. FAFSA not only will set students up with loans to cover school and living costs, they will also match students to grants and work study that can be extremely helpful in paying for college. The only catch is that they ask for a huge amount of information from you and your family on the application. Everything from tax information to family size, information for siblings who are in school, which schools you are interested in and your living arrangements are included on this application that must be done every year. Although this process seems daunting, taking one step at a time and knowing what is required of you will help you to sail through the process. After graduation, many students feel that they need to be completely independent from their parents; this not the case for FAFSA. A large amount of information about parents’ financial information is needed for getting aid. This makes it crucial to have parents on your side while filling out this application. Always be honest with the information asked and don’t be afraid to contact school admission and financial aid departments for help dealing with the jungle that is FAFSA. Thanks Caitlin for your hints on Navigating the FAFSA Jungle. I agree it is crucial for students fresh out of high school to get parents to help complete the FAFSA if they are "dependent" students for financial aid purposes. Best of luck to you.